At first we thought it might be dead, but then as I was taking photos I noticed it was moving slightly every once in a while, so it was definitely sleeping. 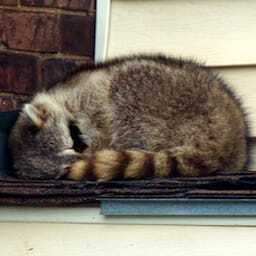 Our neighbours, (who’s driveway I was taking the photos from – not the ones who’s roof this is), came home as I was taking the photos and they told us that this same raccoon has been napping up there for three days now. it’s odd that this was the first time we noticed it! They assured me that it was much too big to be a cub and once they reminded me how dirty these things are, that they carry fleas and how they’re usually rabid, it didn’t look so cute to me anymore. Hm. Sleeping Raccoon was published on Tuesday, May 3, 2011 at 8:47pm EDT by Daniel Menjívar and last updated on April 11, 2018 at 9:30pm UTC .